Team Ireland will arrive into Dublin Airport on Tuesday morning. 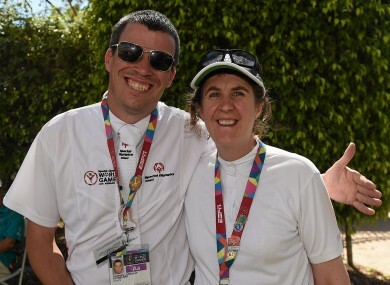 Thomas Connolly, a member of Nightriders Special Olympics Riding Club, from Coolaney, Co Sligo, with Elizabeth Mair, a member of Festina Lente Special Olympics Club, from Rathfarnham. TEAM IRELAND WILL arrive home to a heroes welcome on Tuesday morning and they’ll have some excess baggage. With 16 more medals on the final day of competition, our representatives in LA will return with 86 in total on Tuesday morning. Yesterday, Irish athletes won six gold, five silver and five bronze medals. This leaves the team with a final medal tally of 26 gold, 29 silver, 31 bronze, 31 personal bests and 43 placement ribbons. The Irish ladies basketball team delivered their best performance of the event to date beating Mexico by 19 points to 17 points to win gold. “I am immensely proud of the girls and all the hard work they put in over the last nine months. Despite the strong competition they proved themselves to be the best,” said coach Vicki Ronning afterwards. There was a silver on the track thanks to the relay team while the badminton contingent claimed a gold thanks to Amy Quinn and Brian Hooper in the mixed doubles. At the Drake Stadium in UCLA Team Ireland’s 11-a-side footballers beat Iceland 5-4 on penalties to earn a bronze medal. The athletes and coaches will arrive into Dublin Airport at around 8am on Tuesday. Email “Ireland's athletes bring their medal haul to 86 after hugely successful Special Olympics”. Feedback on “Ireland's athletes bring their medal haul to 86 after hugely successful Special Olympics”.